LANCASTER — The Knight High School football team has a new general for its army of Hawks. Chance Tapia was announced as the team’s new football head coach Thursday, according to a Tweet from the high school’s athletic department. Tapia served as Knight’s offensive coordinator for the past three years. The George Esquer era at Knight High School is over. The three-year head coach of the Hawks football team chose not to return for the 2017 season, Esquer confirmed to the Antelope Valley Press on Friday. His replacement has already been chosen and is awaiting approval from the school board, Knight Athletic Director Tom Hegre said. The beginnings of a multi-year plan addressing the disparity in educational achievement among African American, Latino, white and Asian K-12 students was proposed to members of the Santa Monica-Malibu Unified School District Board of Education on Thursday, May 21. Terry Deloria, assistant superintendent of educational services for SMMUSD, gave a presentation using statistical data of educational performance between those ethnic groups at all SMMUSD schools. Issues raised during the presentation were those of college preparedness, enrollment in advanced placement classes, grade point average, dropout rates and others. The average GPA of African American and Latino students were 2.5 and 2.6, respectively, compared to 3.2 for white students and 3.2 for Asian students, according to Deloria’s data. The data also showed African American and Latino students enroll much less in Advanced Placement (AP) classes than their white counterparts. At Malibu High School, 91 percent of students are white, while only 10 percent are Latino and two percent are African American, according to the school’s demographics. Deloria said the board’s hurdle is trying to keep up with small changes and take them to a system-wide level. Deloria’s presentation outlined what the schools in the district were already doing to help solve the achievement gap, and also gave suggestions to the board as to what can be done moving forward. The data did not only show disparities in education. Deloria’s research found that Latino and African American students were not meeting fitness standards when compared to white students. Several attendees spoke during the public comment portion of the meeting, many to give their approval of the program. However, some community members were not satisfied with the plan brought forth by SMMUSD staff. Tynesha Williams, mother of a student attending Santa Monica High School, focused more on the what the data presented suggested about a student’s psychological well-being. Joan Krenik, member of the Santa Monica-Malibu PTA Council, was complimentary of SMMUSD staff and showed faith in their research. Board member Craig Foster, a Malibu resident, sympathized with the members of the community who were displeased with the data presented by SMMUSD staff, and said the achievement gap was not going to be fixed overnight. At the beginning of the meeting, several retirees who worked with the district were honored by the board. Highlights from their careers were read and those who were in attendance received rounds of applause from the audience. Several former employees of Malibu schools were honored, including track coach John Cary, former assistant principle Wendy Wax Gellis, library assistant Denise Peak, founding member of the Shark Fund Maureen Bradford, and others. The next SMMUSD board meeting will be held at 4 p.m Wednesday, May 27, in the district office. Signs like this one guided participants of the Malibu Cook’s tour to each Malibu Methodist Nursery School volunteer, where they gave information on various sections of each house. Imagine being picked up by a vehicle and driven through the hills of Malibu. The vehicle drops you off in front of a large house, you’re welcomed by a volunteer and you stroll inside. You’re guided through sections of the house and given tidbits of inside information — how the house was built, where pieces of art came from, etc. — as the panoramic ocean views, open floor plans and apartment-sized bedrooms leave you speechless. At the end of the tour, you’re treated to food from a local eatery. Now imagine doing that four times, through four different houses. 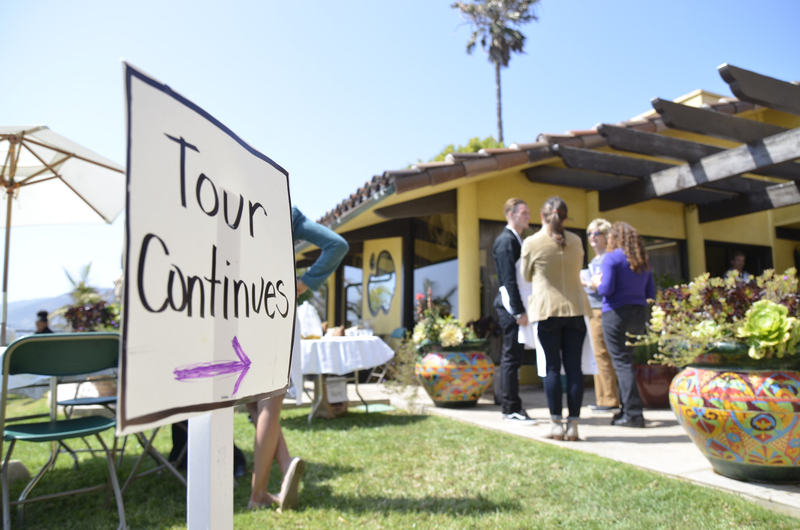 Luxurious Malibu houses were open to 300 people for the 29th annual Malibu Cook’s Tour on Saturday, May 9. Participants received small, yellow “passports” that were stamped at each location of the tour. The booklets contained information on each house and the food that would be served when they arrived. Pravina Somani, owner of one of the homes, said it was overwhelming having strangers walk through her house, but she did not seem to mind. 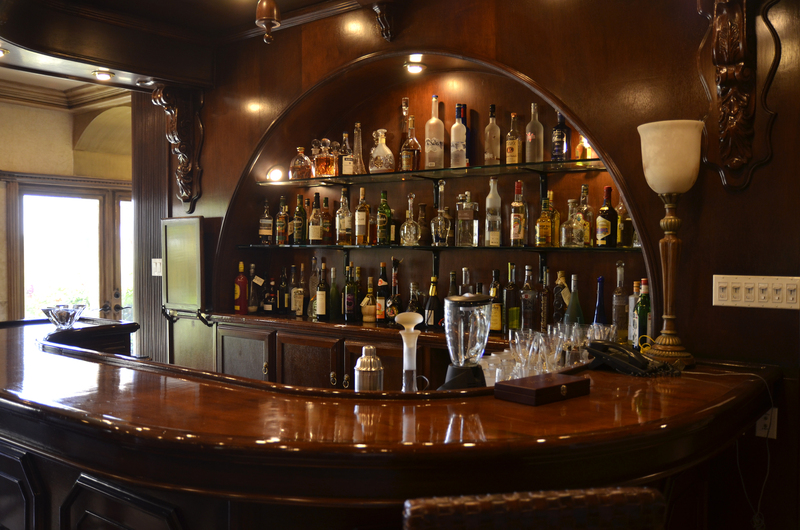 This bar was made in the style of one found at TGI Fridays, the restaurant where the owners of the Bluff Top house first met. This was the first time Somani has shown the inside of her home to the public, she said. 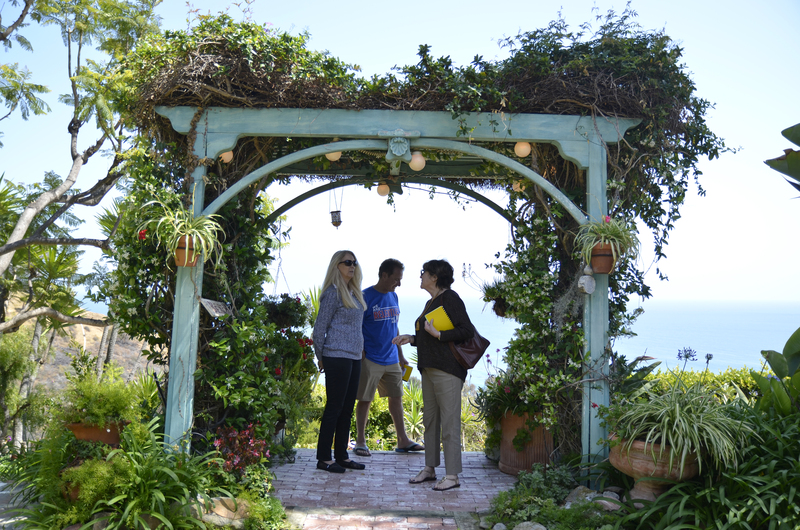 For the past three years, she has shown the outside as a part of the Malibu Garden Tour. Malibu Methodist Nursery School organized the event. Parents of children who attend the school and other volunteers from the community helped guide tour-goers, gave facts and told stories about various sections of each house. Participants received different versions of the itinerary and had to drive themselves to one of the homes. Several shuttles picked up and dropped off people at the three other locations. Yvonne Bosch, one of the volunteers, said the tour is the main event that helps fund equipment for the school, as well as other projects and scholarships. The majority of the tour’s participants were women. Bosch said the reason could be the event usually occurs close to Mother’s Day. Three participants stand under a gazebo in the backyard of the Baker home during the Malibu Cook’s tour on Saturday, May 9, 2015. Bosch said parents affiliated with the nursery school were asked to think of homeowners they knew who might be willing to open their houses for the event. “The homeowners are oftentimes related somehow to the school because they sent their children to the school before, and now they’re grandparents or they are aunties of the child who goes there,” Bosch said. The tour is limited to 300 people to put less stress on the homeowners, Bosch said. The limit also adds to the novelty of the experience, she said. “It’s kind of an exclusive club to get a ticket,” Bosch said. Bonnie Kliger, who lives in Woodland Hills, has been taking in the tour for the past 12 years, and attended Saturday’s event with her husband. “The idea of peeking into the private lives of Malibu homes [is what interests me],” Kliger said. 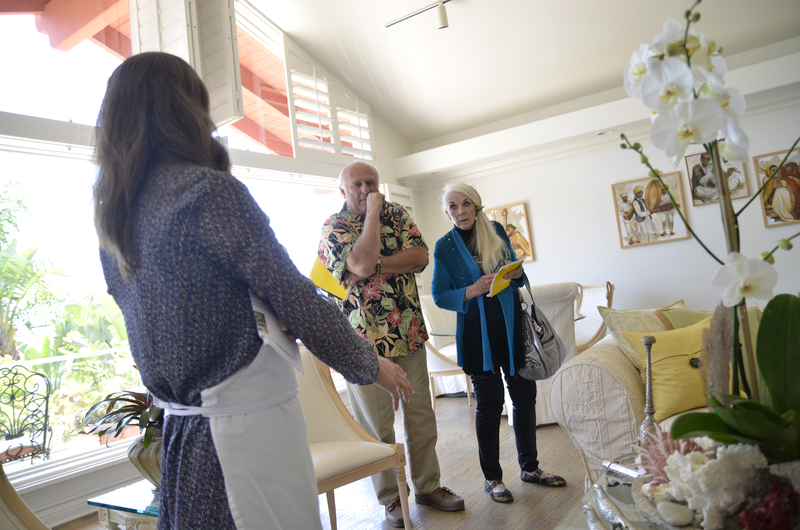 Suzanne Faulkner (right) and Milton Brodleit, residents of Encino, get information from Susan Downey during the Malibu Cook’s tour on Saturday, May 9, 2015. 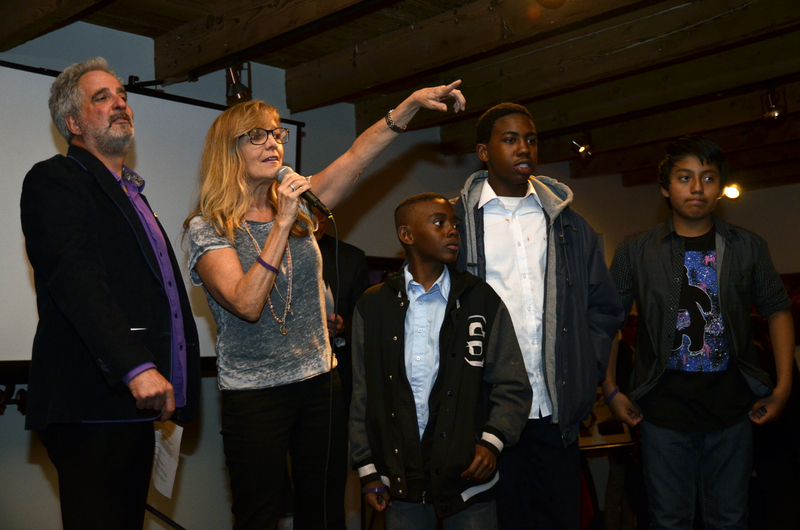 Michel Shane (left), Laureen Sills (second from left) and three children take the stage to auction off an item during the Stars and Sea Gala on Thursdsay, May 7, 2015 at Casa Escobar in Malibu, Calif.
Friends of the Shane family and other community members gathered at Casa Escobar in Malibu on Thursday, May 7, for the Stars and Sea Gala. The event was hosted by the Emily Shane Foundation and sought to raise money for the SEA (Successful Educational Achievement) program, which was started by the foundation and helps struggling children and teens perform better in school. Emily Shane was a 13-year-old girl who died on April 3, 2010, when she was hit by a suicidal driver as she was crossing the street on Pacific Coast Highway. She struggled in school because of what was deemed a “processing issue,” said Ellen Shane, Emily’s mother. During the event, a video montage of Emily’s life was shown. It mostly consisted of photographs of the young girl when she was alive, and two short video clips of her dancing in a talent show and laughing with a friend. 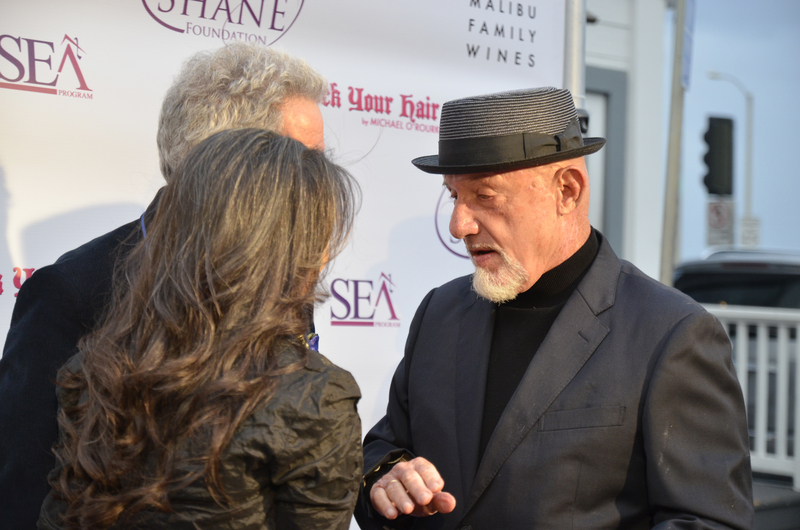 Jonathan Banks, actor from the “Breaking Bad” television series, was Master of Ceremonies for the night. He said he knew Emily since she was 3, and was thankful to those who attended the gala. Banks said he was one of the kids who “fell between the cracks and needed help” with his education, and added that he was almost 20 when he graduated high school. He said what he remembered most about Emily was her life, putting emphasis on the word. “I’ve never seen a child more full of life,” Banks said. 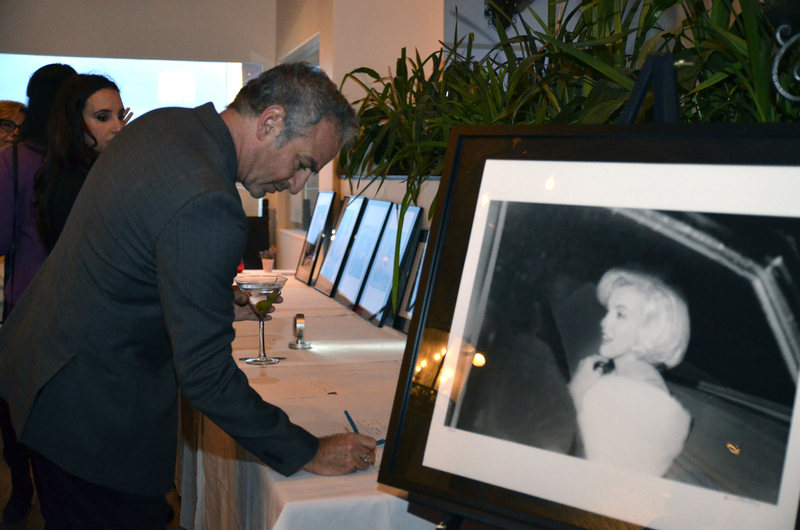 Malibu resident Kevin Cozen bids on a silent auction item during the Stars and Sea Gala on Thursday, May 7, 2015 at Casa Escobar in Malibu, Calif.
Ellen Shane introduced several children who participate in the SEA program. The kids shared stories of their educational improvements as a result of the program. Durron Williams, 14, said SEA helped him with his confidence, and spoke in high regard of the mentors who help him and the other kids in the program. Kelsey Crispeno, a 20-year-old sophomore at Loyola Marymount University, is a mentor for the program. She said her experience there has been unique and rewarding. 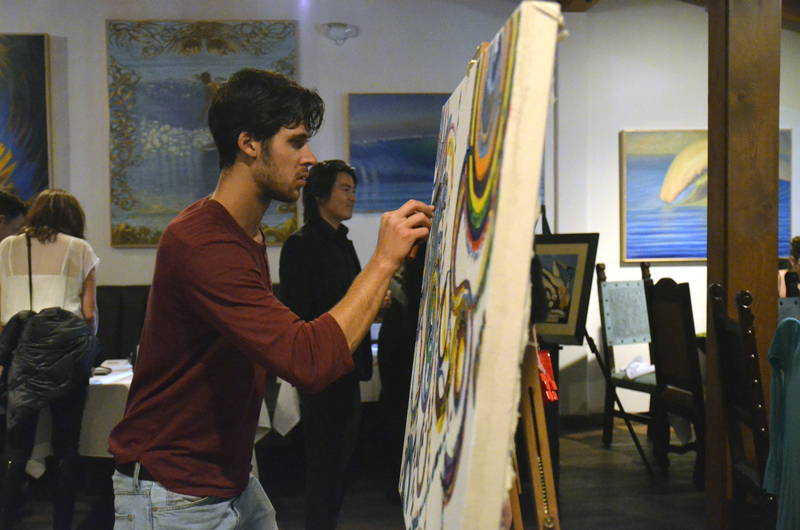 Benjamin Seng paints on a canvas during the Stars and Sea Gala on Thursday, May 7, 2015 at Casa Escobar in Malibu, Calif.
Ellen Shane said she likes to use mentors who are either in college or recent graduates. However, she has struggled finding students in Malibu. The gala featured live entertainment from singer-songwriter Taylor Phelan and comedian Mike Marino. Various items were sold in both silent and live auctions throughout the night. Some items being sold were paintings, photographs of celebrities, Los Angeles Dodgers tickets and more. The Shane family established the foundation in 2012 in memory of Emily. Ellen Shane said she suffers every day, but has learned to cope with the loss of her daughter through her work with the foundation. Jonathan Banks (right) talks to Ellen and Michel Shane during the Stars and Sea Gala on Thursday, May 7, 2015 at Casa Escobar in Malibu, Calif.
A sign showing the health of various beaches in the Los Angeles area is displayed during the Malibu Earth Day Eco Fair Saturday, April 18, at Malibu City Hall. 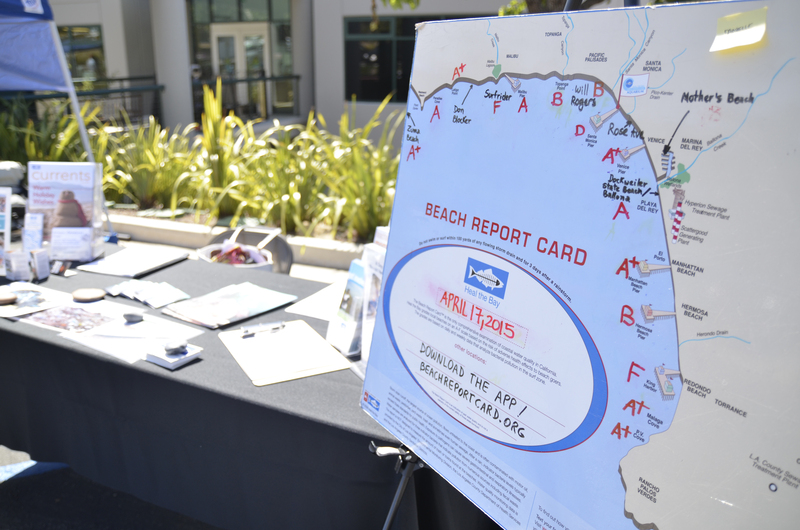 Residents of Malibu and surrounding communities observed Earth Day early with an event at Malibu City Hall on Saturday, April 18, that promoted sustainability and other eco-friendly causes. Representatives from several environmental organizations sat at booths to inform attendees of the event. The organizations included the Surfrider Foundation, the Malibu Chamber of Commerce, Sustainable Surf and others. Wolfe recycles, eats locally grown food and uses cloth bags in an effort to be more sustainable in her own life, she said. 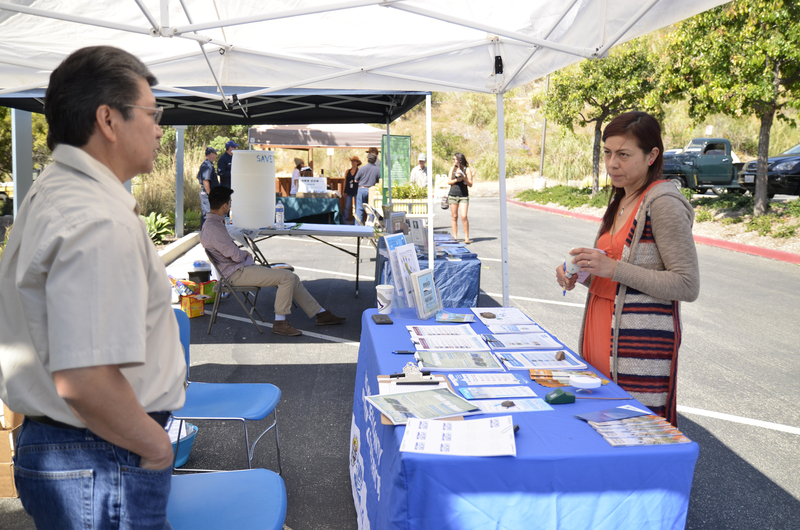 Lucia Corona (right) listens to Ron DeVera of Los Angeles County Waterworks during the Malibu Earth Day Eco Fair on Friday, April 18, 2015 at City Hall in Malibu, Calif.
At the event, City employees provided literature and free items for people at its booth. They encouraged attendees to fill out what they called an Eco Passport, which had pages people could stamp if they visited all the informational booths. Those who got the entire passport stamped were entered in a drawing to win free merchandise from the City. Jennifer Voccola Brown, senior environmental programs coordinator for the City, believes water usage is the biggest sustainability issue that Malibu has to tackle. 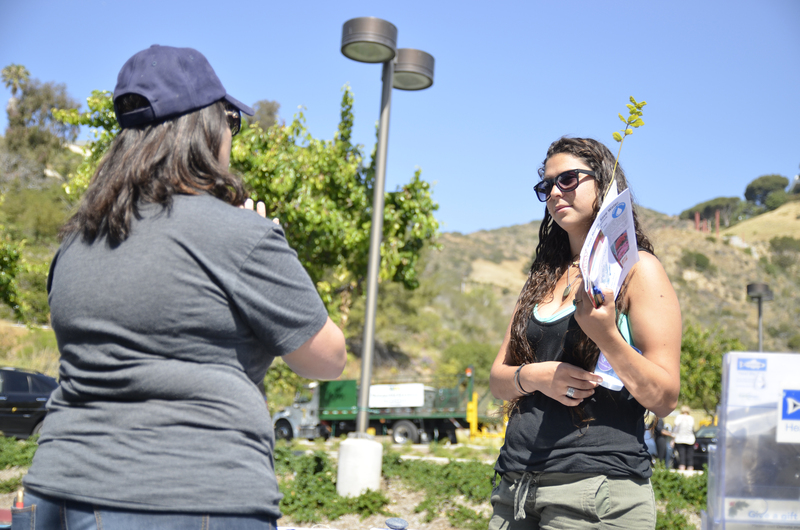 Jessica Wolfe (right) listens to a representative from Heal the Bay during the Malibu Earth Day Eco Fair on Friday, April 18, 2015 at City Hall in Malibu, Calif.
Malibu was named in a recent Los Angeles Times article as one of the affluent areas that use more gallons of water than less well-off areas of the state. The city was among four that used more than 150 gallons per capita, or per person, in January, according to the article. Brown said it can be difficult to reach those in the community with properties that use more water than others. But she said the City is doing its part to give the right information to those residents. The fair attracted dozens of people through the course of four hours. Refreshments were served and a man playing handmade Native American flutes entertained the crowd with his music. 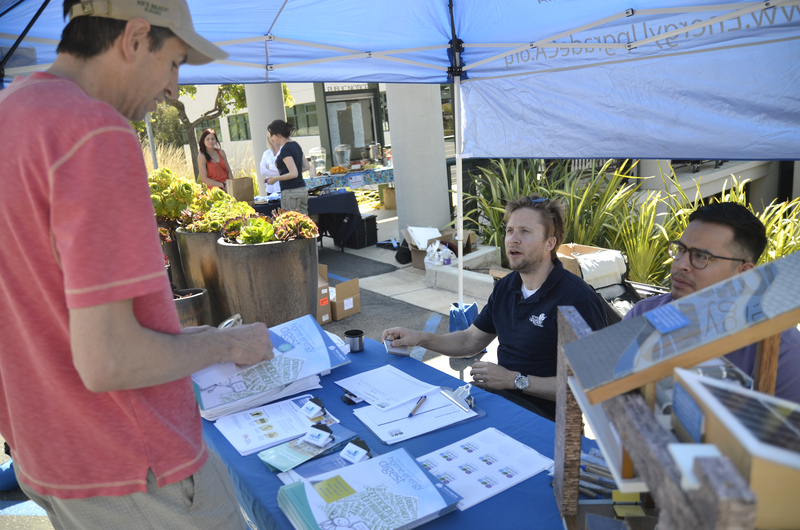 Joseph Nitti, resident of Topanga Canyon, attended the event and said he learned a lot from the information about sustainability and the environment provided by the various booths, and felt that it was valuable to him and others. Steven Guerry (middle) and Kevin Torres (right), representatives of The Energy Network, speak to Joseph Nitti, resident of Topanga Canyon, during the Malibu Earth Day Eco Fair on Friday, April 18, 2015 at City Hall in Malibu, Calif.
Eric Fuchser (center), owner of Vintage Grocers, greets guests as they enter during the one-year anniversary of the store on Saturday, March 7, 2015. Every morning, Maggie Luckerath wakes up, takes a stroll down Zuma Beach and before visiting her local grocery store, Vintage Grocers. She particularly likes to shop for bacon, which she said she could smell from the Malibu Beach Club, where she parks her car before going to the store. She also shops for fresh vegetables, milk, eggs and baked goods. 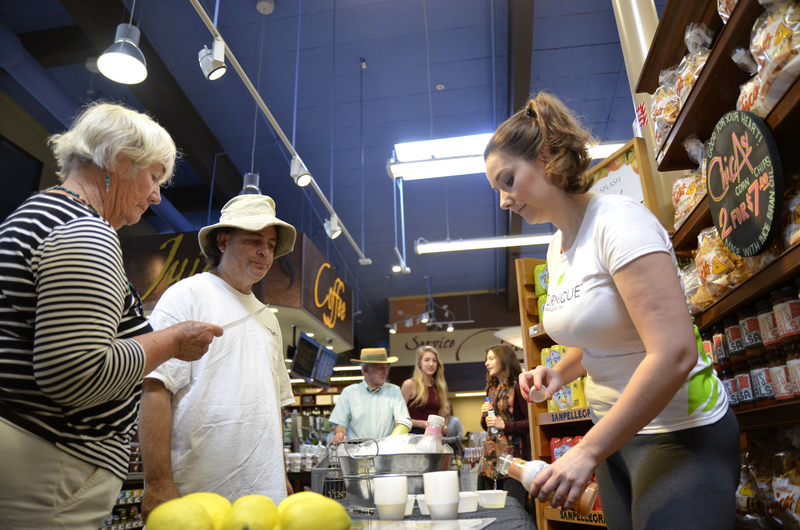 Rachel Mullins (right) pours a sample of Naturinque Energy Tea for Dan Levy (center) and Mary P. Smith inside of Vintage Grocers during the one-year anniversary celebration of the store on Thursday, March 7, 2015. 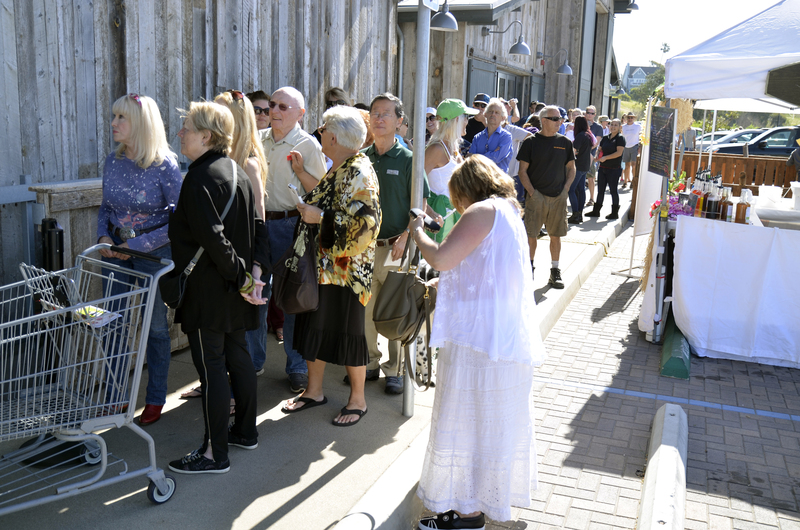 Malibu community members lined up outside of the grocery store before 10 a.m. to receive gift bags containing products such as chips, snacks, drinks and other items. Each bag had slightly different variations of items inside. Eric Fuchser, the director of the market, greeted patrons with hugs and handshakes as they entered, and expressed gratitude to them for helping the store remain open throughout its first year. Luckerath described the store as “Whole Foods on steroids,” to which Fuchser laughed heartily. 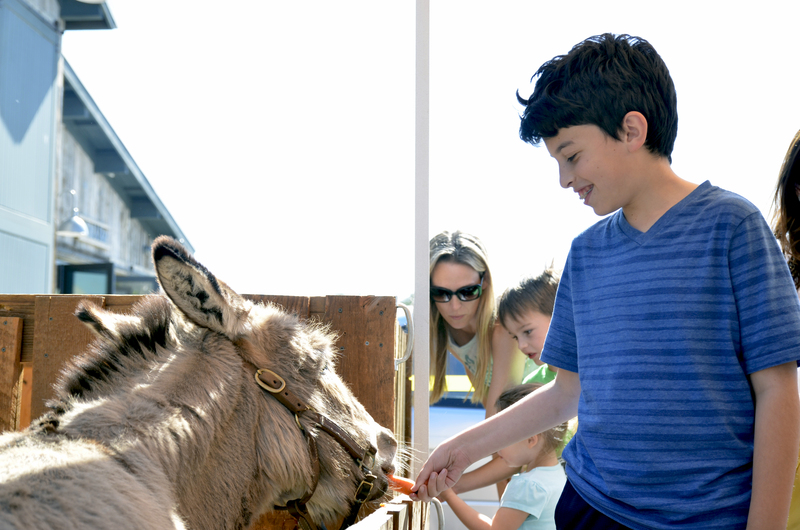 Benjamin Katz, 11, feeds a donkey outside of Vintage Grocers during the one-year anniversary celebration of the store on Thursday, March 7, 2015. Inside the store, product representatives set up tables and gave samples to shoppers. Products included the local Bloody Mary mix, Malibu Mary, and Naturinque Energizing Tea. Outside the doors of the store, local band The Roman Helmets played classic rock cover songs until 2 p.m.
A miniature petting zoo, which included a donkey and two goats, was available for shoppers or others in the area outside the store. Fuscher said he’d love to see the business grow, and will be looking for expansion opportunities in the future. Brooks Stewart, a Malibu resident, likes to shop at Vintage Grocers because she is able to buy products that can’t be found in regular grocery stores, such as certain candies, cheese and other things that are found in Italy and Spain. 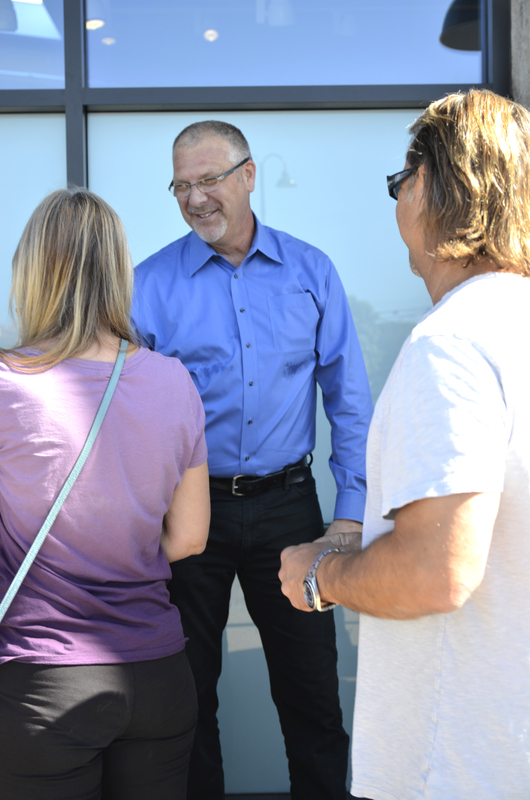 Stewart also feels the store has become an integral part of the Malibu community. Dozens of patrons line up outside of Vintage Grocers to receive a gift bag during the one-year anniversary celebration of the store on Thursday, March 7, 2015.